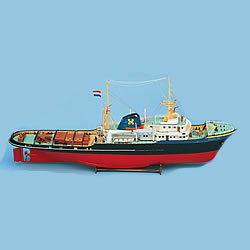 Billings Boats BIL592 Zwarte Zee-Ocean Tug 1/90 scale ABS hull! The Zwarte Zee was built in 1963 at J. & K. Smit’s Scheepswerven N.V. in Kinderdijk, Holland. Length 77.50 m, breadth 12.35 m, draught 6.90 m and gross tonnage 1,539 tons. Driven by two Smit-M.A.N. turbo diesel engines yielding 9,000 HP. These machines drive a single propeller shaft through Vulcan fluid clutches and reduction gears. When a fast manoeuver is necessary, one of the engines can drive forwards, the other reverse. Speed 18 knots.